Lastingham is situated on the southern fringe of the North York Moors, and lies 1 1/2 miles to the east of the village of Hutton-le-Hole. Of ancient origins, the village was originally referred to as Læstingau, the first recorded mention of it occurs when King Ethelwald of Deira (651-circa 655) founded a monastery there where he intended to be buried. The Venerable Bede attributes the initiative to Ethelwald's chaplain Caelin, a brother of Cedd, St. Chad and Cynibil, early Christian missionaries to the Angles..
Bede informs us that that Cedd and Cynibil consecrated the site, and that Cynibil built it of timber.Cedd served as the first abbot of the monastery, combining this position with that of missionary bishop to the East Saxons. In 664, shortly after participating in the Synod of Whitby, St. Cedd died of the plague at Læstingau. Cedd was first buried outside the wooden monastery but, at some time between 664 and 732, a stone church was erected, and his body was translated to the right side of the altar. His brother St. Chad assumed his place as abbot. In 687, one of its graduates, Trumbert, transferred to Wearmouth-Jarrow and became scriptural tutor to a youthful Bede. Lastingham nestles in a natural hollow, whilst a moorland-fed stream gently flows between the tiny greens and characterful stone cottages. One side of the village edges onto open moorland, which stretches away to the north. The bridge at the top of Low Street has a commemorative tablet to John Jackson RA, a celebrated artist who was born in the cottage opposite in 1778. The Rev. Thomas Brown, a writer of Yorkshire dialect poems, was also born in the village in 1771. The village post office dates to the early half of the seventeenth century, the inn, the Blacksmith's Arms, which stands opposite the church bears an inscription over the door reading 'John Page, 1776'. 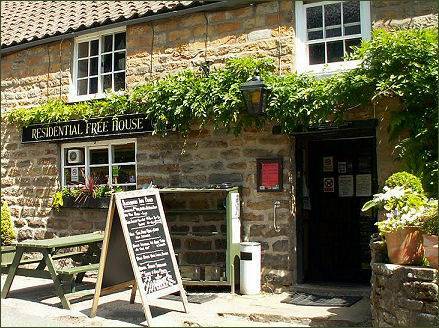 The characterful building retains many of its original features including exposed beams and an open fire place, it offers accommodation and serves excellent food. There are three holy wells in the village, dedicated to St Chad, St Ovin and St Cedd . They once formed part of the water supply to the village, until more recent times when the mains water was piped from West Ness. St. Cedd's Well (pictured left) is situated at the end of the bridge which spans the beck near the centre of the village. It has a canopy of stonework brought from Rosedale Abbey, and is inscribed with a reference to Cedd's foundation of a monastery at Lastingham in 648, and to his death in 664. St Chad's Well stands on the east side of the High Street and consists of of a stone trough inside a well-house. Chad later became Bishop of Lichfield, of York, and of Lindisfarne. 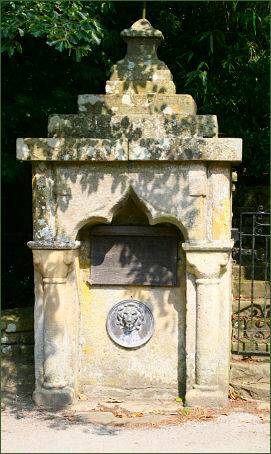 A legend attached to this well relates that Wulfhere, King of Mercia who, filled with remorse after putting his two sons to death for worshipping at Chad's cell, adopted Christianity at the instance of his Queen, Ermenilda. The third holy well in the village, St Ovin's Well, is across the road from the Post Office, and consists of an arched well-house set into wall. The story of St Ovin as told by Bede; relates that he gave up high position in the household of Queen Ethelrid and went to Lastingham monastery. He later went to Lichfield with Chad. The village church of St. Mary's at Lastingham was originally planned as part of a much larger monastic community, it was founded in the seventh century and rebuilt by the Normans in 1078, when St. Stephen, prior of Whitby Abbey, moved to Lastingham following a disagreement with William de Percy, the then abbot of Whitby. St. Stephen received support from King William the Conqueror and Berenger de Todeni. The foundation was abandoned after a decade when the monks moved on to St. Marys Abbey at York. In 1228 the small church was adopted as the parish church of the village after the monks had left. A north aisle was added to the building followed by a south aisle in the fourteenth century, the west tower was added in the fifteenth century. The church had deteriorated into in poor structural condition by the seventeenth century, it was rebuilt by Thomas Ferres, who later became Mayor of Hull. The interior contains a twelfth century font, a medieval floriated grave slab, and a free-standing fifteenth century water stoup. The church still retains some of its early Norman architecture and its ancient crypt has survived almost unaltered in the last nine hundred years. 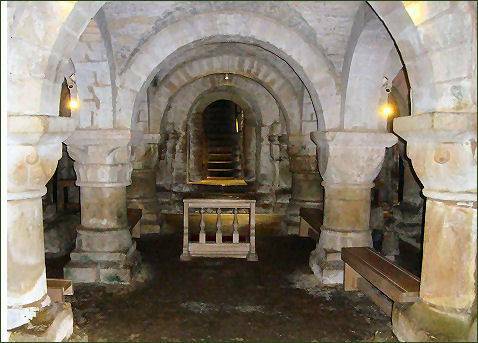 The crypt is like a church in miniature, with aisles, a stone altar, chancel, and superb vaulted roof. The thick, circular columns which support the aisle are beautifully carved with ornate decoration, dating to St. Stephen's work between 1078-88. Stephen and his monks reused earlier Saxon stones around the base of the crypt pillars, some dating to the eighteenth century. The traditional site of Cedd's burial is immediately to the right of the altar table.